Q: What is zEdit cache? A: When you build patch, zEdit creates cache for all your mods, which is kept in zEdit/profiles/Skyrim/patcherCache.json. TUS creates a lot of new records, and cache makes sure that, when you rebuild your patch, all those new records keep their formID, and your saves are not screwed. This cache is super important. You must keep it. You can't change it. If you lose it, when you run patcher next time, it will create records with NEW formIDs, and previous records (lvl lists, outfits) will be lost. I'm not really sure if your save will be still playable after this. I actually think you will just run into a few naked NPCs, which can be reverted to normal state using "resetinventory" or "recycleactor" command. But I'm not sure about it. So, it's better to be safe than sorry. Q: I don't really understand how encounter zones and NPC levels work. A: There is an excellent article from SkeletonJack (author of OMEGA Overhaul). Q: I want to change your configuration json files. What do "Keys" and "ForbiddenKeys" mean? A: Patcher typically checks a record EditorID and compares it in entry of configuration file. Patcher checks if EditorID contains at least ONE of the Keys and if EditorID doesn't contain ANY of ForbiddenKeys. This is correct for encounter zones, NPCs, perks and so on. Some other configuration files use Keyword or Faction for checking. These don't have any of ForbiddenKeys, and their Editor ID must be entered fully and precisely. Q: I am getting Error cacheRecord is not unique. A: THIS SHOULD BE FIXED BY THE LATEST TUS UPDATE. FROM NOW ON TUS WILL SIMPLY BUILD JUST ONE OUTFIT/LVLI FOR ALL NON-UNIQUE RECORDS. 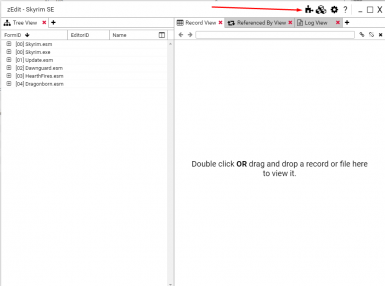 Download Duplicated Editor ID Fixer from this mod files page. Run it on your load order. It will change your mod plugins. Review changes in zEdit. Save changes. Disable Duplicated Editor ID Fixer - you don't need it anymore. Remove zPatch.esp generated by DEF - it is empty, you don't need it. Now True Unleveled Skyrim can patch your load order. True Unleveled Skyrim requires zEdit 0.4.2 to work. zEdit 0.4.2 is available only as x64 application, which is not compatible with MO1 and, obviously, with 32-bit Windows. Mator, author of zEdit, will release x86 version of next major release of zEdit. There are no ETAs for it. If you don't want to move to x64 Windows /MO2, you can only wait until mator releases zEdit x86. OR you can follow his instructions here and build x86 zEdit for yourselves. Please stop asking me questions about running TUS as x86. Can you provide more details on how the unleveled encounter zones are calculated? In the zoneTypesByKeyword.json, there is a min/max level and a range. Not sure what ranges does. Also not sure how the zoneTypesbyEDID interactions with the keywords. Are they additive? I also see a lot of MinLevel settings of 1, which doesn't seem very unleveled since they would still scale a lot if you're below the max level of the zone. Seems that would bias the difficulty curve toward the easier end (enemies scale down but not up). Also for the removal of NPC offets, does this mean creatures and dragons will be much easier? Dragons get most of their HP from the offset value. The player at level 1 also gets half of their HP/MP/SP from the offset as well. Just wanted to pop back in and say: This mod is the answer to my prayers. I've been using it for a few months now, on several different playthroughs, and it's amazing. Want to use lesser-known armor/weapon/spell/new lands/ANYTHING mods? But also want an unleveled game? NOW YOU DON'T HAVE TO CHOOSE. USE WHATEVER MODS YOU WANT, AND STILL HAVE A REALISTIC, LIVING SKYRIM THAT DOESN'T REVOLVE AROUND YOUR CHARACTER. YOU'RE FREE! Seriously, if anyone reading this is on the fence, please download this mod. It's so, so easy to use and brilliantly implemented and wonderful. I can't praise it highly enough. For me this mod seem to make everything very, very easy. Without any good items, with OK armor my Orc melee-char could clear a Hagreaven nest with Forsword pretty easily at level 5.... Have you encountered any really high level content? How is this unleveled? 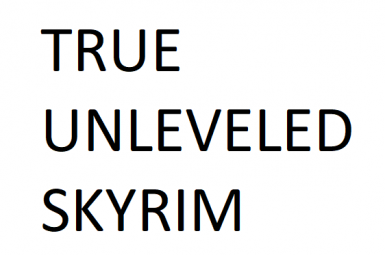 In lower levels I breeze through everything easily unlike with "Skyrim Unleveled". Its insane that this mod isnt higher rated, such a good tool and had to search for over an hour to find it, thanks man. There is an excellent article from SkeletonJack (author of OMEGA Overhaul). It's more complicated than a "cap"
Wouldn't IA on its own work just fine with the patcher? I'm assuming that the gear added by IA has keywords that identify the material type of each piece of armor. Edit: Sorry about the double comment, it originally said that my comment failed to post so I submitted it again. I guess one of my many mods has an NPC with a missing class entry? I've now found some previous discussion about this. I'm not using 'vanilla actors recycle project' so it's not that. >I guess one of my many mods has an NPC with a missing class entry? I had this error with Realistic Dialogue Overhaul and BUVARP. I noticed that the RDO NPC it stopped on was missing a CombatStyle entry (had been removed by BUVARP. I copied that over, but also made sure the Editor IDs matched for two of the NPCs' Classes that had been changed to [insertclassnamehere]DUPLICATE001 , because I've had issues in the past with patchers when there are mismatches with Editor IDs and even Names (I assume certain functions can only reference those, rather than form IDs.) Not sure which change fixed it, but making sure those three values matched between RDO and BUVARP made it patch with no issue. I used to be adventurer like you ....then I read instructions of this mod. Hey I am attempting to create a patch of this mod in SSE but it states that I have hit the 254 limit even though many of my esp are flagged as esl. Is there a way around this? Here is the log error file. [ERROR] Error: Failed to create new element at: 0, "TUS.esp"
Maximum plugin count of 254 reached. That what I figured by reading the comments and reddit. It s a shame at the moment. Oh well, I will have to wait! Thanks! There's no way around it period. A plugin can only have 254 masters so any dynamic patchers (which add all plugins as masters to their output esp) can't work with load orders above 254 plugins. So even if zEdit could work with ESLs and above the 254 limit, a patcher can't (since the 254 master limit is a bethesda thing). A patch file doesn't really need to have all 255 plugins as masters. Typical ESP-ESL plugin only overwrites some records, so it isn't needed to be added to second patch as master. zPatch (is a generated patch for the guy, when it is generated it uses latest overwrite from ESP-ESL, but it requires only ESP as master. There is no need to have also ESP-ESL as a master). Agreed. But I think ESLs or ESL-flagged ESPs with new records that are added to a patch still need that plugin to be added as a master (for the override). I'm sure Mator will find ways to mitigate the situation either through the method you describe and/or loading/adding as master only necessary plugins, but I don't think that 254 masters limit is going away anytime soon if at all. Actually if you know what you want to patch you may temporary disable plugins not needed to be patched, because they do not have for instance any armor or weapon inside. In most cases this scenario can work and I believe is relatively save. Wow, Finally I found what I'm looking for! but I have a question?! should I use it with Requiem 3.0.1? or incompatible? "Loading Outfit records from HOR_OrdinatorPatch.esp. [ERROR] Error: Failed to get child elements at: TUS.esp\930033C6, "INAM"
Just a note it also has pretty similar errors with True armor , Alchemical Ointments, Wearable Lanterns, and "Armor and Clothing Extension" . As far as I know only two of those even have records for leveled list / outfit. Technically it isn't a issue not to load True armor / Alchemical Ointments while making the patch . However, I'm pretty sure that I do want the changes in outfits applied in "Armor and Clothing extension" and to be sure lanterns show up in shops. I guess I'll just use it for just perk distribution / leveled zones for now since the patch seems to build with everything loaded when I excluded item lists.